My cat Pharaoh passed away in his sleep last night. He had been ill for a couple of days with bladder and kidney problems. My local vet treated him on Thursday and Friday, but had warned me there was only a 50 percent chance Pharaoh would recover. Thanks very much to everyone to sent healing wishes for Pharaoh. I am sure the energy and magic sent his way would have helped ease his suffering and made his passing as peaceful as possible. I only had Pharaoh for a short time, having given him a home after he was found living as a stray earlier this summer, but I loved him. 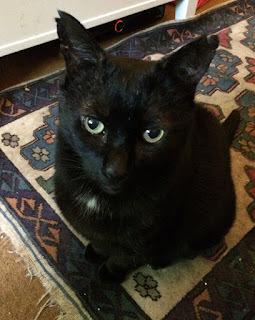 I would also like to thank Cats Protection, who saved him from presumably an even shorter life and who introduced me to him, and my vet who did all he could to treat his condition. Oh no , I am so sad to hear this . Stay strong . I adopt old cats too. It's so sad when they pass on, but it's wonderful to give them a good 'retirement'. May you see Pharaoh again in the Otherworld. I am sorry for your loss, I am sending light to you both. I'm so sorry, I wish we could have helped more. So sorry. It is a blessing though for him that he spent his last few months enveloped in your love and care. Although not a cat lover myself I am sorry for your loss, I hope you can give another old stray cat a happy home. I am going to wait for a month or so before adopting another cat, but I will go back to Cats Protection or a similar rescue charity and give a home to a cat who needs one. So sorry for your loss. Cats find their way into our lives and hearts. Pharaoh is with Bast, and when the time is right I am sure another unique little spirit will find its way to your home.